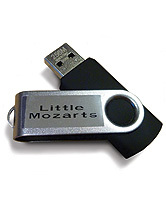 This convenient flash drive contains 224 fully orchestrated General MIDI (GM) accompaniments for each of the keyboard pieces in the four Music for Little Mozarts Lesson Books as well as all of the songs and activities featured in the four correlated Discovery Books. The flash drive functions only in electronic devices with a USB port and GM compatibility (such as a computer or digital piano). When used with a GM-compatible digital keyboard that has a tempo control, the speed of the accompaniment can be adjusted as needed by the teacher or student. In addition, the accompaniment and student tracks can be separated to enhance practice and performance. The sturdy flash drive has a capless swivel design and a lanyard/keychain connector.